World No. 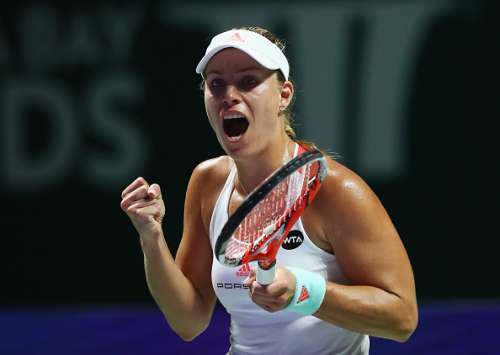 1 Angelique Kerber brought forth all her fighting skills to stave off a mighty challenge from Dominika Cibulkova and get her WTA Finals campaign off to a winning start at Singapore on Sunday. The reigning Australian Open and US Open champion edged past the seventh-seeded Slovak for a 7-6(5), 2-6, 6-3 win in 2 hours 17 minutes. With the two locked at 4-4 in their head-to head record, an enthralling battle was always on the cards. The 27-year-old Cibulkova, a former Australian Open runner-up, is a debutante this time and came to this event with some sizzling form. Post the US Open, she had triumphed at Linz and reached the final at Wuhan. Kerber, on the other hand, was never the same player once she climbed the pinnacle of the world rankings, winning just five matches after her big win at the US Open. But like she had shown so many times this year, the southpaw knew when to step up. The feisty Cibulkova was broken early in the opening set and conceded the lead to Kerber. Unfazed, the Slovak came back to level and send the set into a tie-break which the German won. The setback could not deter the seventh seed from racing through the second set and breaking the top seed thrice en route to taking the set. In the decider, Kerber wrested control through her solid defense and made in-roads into Cibulkova’s serve twice to grab the win. “It was for sure a little bit better than the last match I played here against Safarova last year, but it’s always tough to play the first matches here,” Kerber admitted. The World No. 1 is looking to progress out of the group stage for the first time. In contrast to Kerber, the 2014 runner-up Simona Halep had it pretty easy in her opener. The third seed dominated her match from start to finish to outclass the sixth-seeded Madison Keys, 6-2, 6-4 in 1 hour 9 minutes. With such a commanding performance, Halep now leads the Red Group with Kerber right behind her at No. 2. It was supposed to be a tough match-up for the WTA Finals debutante Keys. She had not been able to solve the Halep code since their very first meeting which she won in January, 2014. The American lost the subsequent four meetings three of which came this year. There was thus no doubt that Halep would come into this showdown, brimming with confidence. And that is exactly what she did. The only time that Keys managed to provide some resistance was in the eighth game of the second set where she broke back the Romanian after going a set and a break down. The joy, however, was short-lived as the third seed soon came roaring back and snatched the win. The World No. 4 later on acknowledged that being familiar with her opponent helped her a lot in her first match at this prestigious tournament. On Monday, second seed Agnieszka Radwanska will start the defense of her title in the White Group when she takes on Moscow winner Svetlana Kuznetsova in the first match. It will be followed by a clash between the French Open titlist Garbine Muguruza and US Open runner-up Karolina Pliskova.